Mr. Reggie Thomas was born in Joplin, Missouri, January 8, 1929. He was baptized at the age of eight years in the South Joplin Christian Church, Joplin, Missouri. In 1943 he and his parents moved to Miami, Oklahoma, where he became very active in the First Christian Church. He dedicated his life to a specific Christian service at the age of 16, and under the ministry of Russell L. Martin was inspired to begin preaching immediately. He preached for one year, during his senior year in high school, at the North Miami Christian Church, Miami, Oklahoma. Following this, he and his high school chum, Lloyd Cameron as singer, began to tour the country in revival campaigns. Then followed four years of Bible Seminary education at the Cincinnati Bible seminary, Cincinnati, Ohio. Mr Thomas graduated from CBS in 1951 with a Bachelor of Arts degree. He then toured the nation for four years as a full-time traveling evangelist, the last year and one half of this time as a CRA evangelist. During these years in evangelism, more than 100 revival meetings were held in nearly every state in the union. These revivals resulted in more than 4,000 souls won to Christ. In 1955 Mr Thomas became the minister of the Catlin Church of Christ, Catlin, Illinois, and was in his seventh year of service there when he was called to the ministry at East Point Christian Church, East Point, Georgia. During his years at Catlin, the membership more than doubled. The population of Catlin was 950 and at the time that Mr Thomas left, morning worship attendance was averaging 520. There were more than 1000 new members added to the congregation at Catlin during his years of service there. A new quarter of a million dollar building was built and paid for; also a new $25,000 parsonage was built during his ministry at Catlin. In April 1961 he began his ministry at East Point, Georgia, During his first five years at East Point, more than 1171 were added to the local congregation. On April 10,1965,1241 were in attendance, While he was very busy as an active evangelistic minister of a local congregation, Mr Thomas also took time to serve in many areas of the Lord’s work. During the year of 1964 he served as President of the Southern Christian Convention. He also served two terms as Chairman of the Board of Trustees at Atlanta Christian College, East Point, Georgia, He served in 1966 as Vice President of the North American Christian Convention. He has served as an active trustee of the following institutions: African Christian Mission, Rhodesian Christian Mission, Christian Television Mission, Dixie Christian Service Camp, South Pacific Evangelizing Fellowship, the Atlanta Christian College and Revival Fires F.A.M.E., H.A.S.T.E.N., A.R.M., & WEGO Ministries. In addition to these many duties, he also served, 1961-1966, as a part-time professor at Atlanta Christian College, teaching Personal Evangelism. In 1965 he was nominated one of 10 outstanding young men of America and his biography appeared in the 1965 edition of "Outstanding Young Men of America." During the years 1966 through 1971 Reggie Thomas served as full-time evangelist with the Christian Restoration Association in Cincinnati, Ohio. His evangelistic work took him to many parts of the world. In 1967 he and his family toured Australia for three months. In 1968 the Thomas evangelistic team toured the African nations of Rhodesia and Zambia for three months. In 1969 the team was in Mexico. In 1970 the team spent three months in the Kiamichi Mountain Mission of Oklahoma. In 1971 the team went all the way around the world spending two months in India. These overseas evangelistic campaigns resulted in more than 5000 souls baptized into Christ. On June 1 , 1971, Mr Thomas resigned his position with the Christian Restoration Association and accepted Cecil Todd’s offer to become Director of Overseas Evangelism for Revival Fires Ministry. Reggie served as Director of Overseas Evangelism un- til 1978 at which time he organized White Fields Overseas Evangelism. It is the goal of White Fields to take the Gospel to every nation. From December 1979 until June 1987, Reggie served as Senior Minister of Hickory Valley Christian Church in Chattanooga, Tennessee. The following was written in the Hickory Valley Christian Church centennial yearbook in October 1988. Reggie Thomas, an Evangelist from Missouri, preached a revival from September 16-21, 1979. Following the revival he was asked to become Senior Minister and after much thought and prayer accepted the call. Brother Thomas began his ministry on December 16, 1979. We observed many outstanding days, one of which was "Incredible Day" on September 28, 1981, when we set a goal to raise $50,000 to carpet the sanctuary, provide a church bus, pave the parking lot, etc. This goal was realized. The sanctuary was refurbished with new wall to wall carpet, pews were refinished and reupholstered, and the pulpit and choir area was enlarged and remodeled. Two new congregations were begun by the Hickory Valley Christian Church, The North River Christian Church in Hixson was begun in April, 1982. They have completed an auditorium and a youth building and are now self-supporting. The Mountain View Christian Church in Ooltewah was begun in August, 1985 (they broke ground for their first unit building on March 27, 1988). All indebtedness on the church buildings was paid off and on April 5, 1987 a Bond Burning Celebration was held. Missions giving increased substantially. There were 475 additions during his seven year ministry. Brother Thomas resigned effective May 24, 1987 to return to fulltime evangelistic work. He hopes to see every nation in the world reached for Christ. He is trying to preach where the Gospel has not yet been preached and start as many new churches as possible. During the past 48 years, Reggie has preached and directed great crusades in six continents of the world. In Africa he has preached to some of the most primitive people on earth and thousands were baptized. In India he has preached in the world’s largest leper village. He has criss-crossed Australia and New Zealand, and has preached on many islands of the seas. He was preaching in Chile, South America at the time of the attempted coup, June 30, 1973. He has lived through 2 coups in Nigeria, 2 coups in Ghana, and 5 coups in Haiti. He has traveled over three million (3,000,000) miles preaching the Gospel of Jesus literally AROUND THE WORLD. He has a thrilling story to tell what God has done in overseas evangelism. Since 1966 Mr. Thomas has traveled in 80 different countries of the world. To date, over 275,OOO souls have been baptized into Christ as a part of this overseas ministry. On January 9, 1988 the Kerala Christian Bible College, Ayoor, India, bestowed the honorary Doctor of Divinity Degree upon Reggie in recognition of 22 years of dedicated evangelistic crusades worldwide. The degree was also granted in appreciation for 13 trips to India. Many people have shared in these crusades including his own family. His dedicated wife, Esther, travels with him in his meetings. 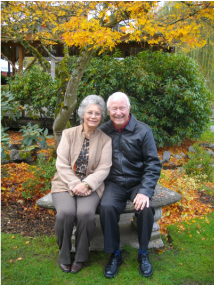 Reggie and Esther are thankful for their eight children and their twenty six grandchildren. In 1962, my wife and I had the good fortune to travel the United States, preaching, in many of our lovely American churches, as well as attending gatherings at some of our splen did Bible colleges, and, experiencing such highlights as the Kiamichi Clinic and the North American Christian Convention, Lexington, Kentucky. What a revelation! From then on we hoped to have some part in sponsoring an evangelistic team from America to visit Australia, and in so doing bring with them something of the vital, and living force of New Testament Christianity. Then it happened! Early in 1966, a letter came to us from Reggie Thomas, at that time ministering at East Point, Georgia, asking if it were at all possible to arrange an evangelistic tour of, Australia. We had only briefly met Reggie Thomas when we had visited Atlanta, but we knew of him by reputation; that he had a passion for souls, a passion for evangelism, and a passion to do great exploits for Christ, Alice and I looked at each other on receiving Reggie Thomas’ letter and wondered if we could surmount all the difficulties in arranging an Australian itinerary. Then we agreed that if Reggie had the courage to undertake such a venture, we had to do everything we could to promote such an effort. In the meantime Reggie Thomas left East Point Christian Church, and undertook the position of evangelist for the Restoration Herald Association, A great mass of correspondence passed between us, and to the various Australian Conference Executives in Queensland, New South Wales, and Victoria, Above all else we wanted their approval. It was agreed that any such effort was to be aside from church politics of any kind. Reggie Thomas made it quite clear that his business was to preach Christ and to promote New Testament Christianity. Interested churches were contacted and finally an itinerary was drawn up; the first of its kind on such a scale unveiling the fast growing movement of those we refer to as our Independent Churches. Hitherto, at the Australian end unknown by the rank and file. In due course Reggie Thomas advised us that his fundraising efforts in the United States had proven successful. He also told us he would be bringing his family; and that his song leader would be Jerry Taylor, a student at Atlanta Christian College (father of five children) and Paulette Pitman who would chaperon the Thomas children and also share in the singing. Paulette was then a student at Ozark Bible College. We were greatly encouraged by Reggie Thomas’ faith. In due course the Thomas team arrived in Queensland with some forty pieces of baggage and faced a barrage of press and T.V. cameras, and were met by Brisbane brotherhood representatives, Conference President Maurice Pieper, and Women’s President Mrs. Cassie Baker, and there were of course several ministers from a number of churches. Some forty shared in a luncheon with the Thomas team. That night their Brisbane city wide campaign opened. Torrential rain fell with record floods in Brisbane, with only three fine nights for the Crusade, but the whole effort was as reported in the Australian Christian "undoubtedly one of the grandest blessings that our Brisbane churches have ever experienced. " The journal goes on to say: "Perhaps the most thrilling aspect of the entire Crusade was the clear, powerful, authoritative preaching by Reggie Thomas.’’ This volume of sermons presented in this book are those preached in Australia but chiefly at Margaret Street, Toowoomba, Queensland, where I was resident minister at that time. The Brisbane Crusade ended with 58 primary confessions of faith, 44 of whom were baptized into Christ during the Crusade, and there were others who followed soon after. After Brisbane, the team left for Toowoomba where we ministered at the Margaret Street Church of Christ. Rain was still falling at this wonderful mountain city, but the Reggie Thomas Team captivated all who heard them, and apart from two or three average meetings, the chapel was filled to capacity night after night. At Toowoomba forty made decisions and 3 1 were baptized into Christ. One of the meetings exceeded any attendance in the history of the church. The farewell scenes to the Team were very Moving. Other campaigns followed at Wollongong, New South Wales, then a visit to the National Church of Christ, Canberra, A.C.T., with the next appointment at Geelong, Victoria, which culminated with a tremendous final rally in our City Church of Christ, Melbourne supported with glorious items by the Victorian Churches of Christ Choral Society. There remains little else to be said except that this visit was but the beginning and a forerunner of teams visiting our Australian churches, Reggie Thomas also has organized two plane-loads of evangelists invading our churches conducting therein campaigns. It is worth noting that at a State Conference, Queensland, it was moved, seconded and applauded on the floor of Conference our gratitude to Reggie Thomas for his tremendous campaigning resulting in an increased membership State-wide for that year. In all we are thankful to have had the privilege of organizing the first Thomas campaign in Australia. We did so with great joy since it meant a means of returning in some measure what was done for us by so many when we toured the United States, Do buy this book of sermons and find out for yourself the essence of good Gospel preaching, which is so seldom heard to day. I have known Reggie Thomas as a friend, a fellow evangelist, a co-laborer in about five revivals, and have heard him preach on innumerable occasions in various types of meetings. Reggie’s sermons are like his life. ‘He is an indefatigable worker. He has a genuine passion for souls. He is a great personal worker and uses scriptures so effectively in the home of a prospective Christian. He is dedicated to the simple New Testament message and to Restoration principles. He preaches with simplicity, earnestness, and a sense of urgency. His evangelistic campaigns have been among the most memorable over the last several decades. Every local ministry in which he has been involved has been noted for a tremendous soul-winning emphasis and success. He possesses a world-wide vision. It was my privilege to be associated with him in his first overseas evangelistic endeavors when he labored as an evangelist with the Christian Restoration Association. He built some significant bridges with brethren in Australia and made a tremendous impact on the country "down under." His pioneer spirit has led him to fields destitute of New Testament Christianity. Overseas he has recruited, helped to train, and raised support for many national evangelists. With this type of background, it is understandable why Reggie’s sermons are well-organized, full of scripture, excellent il lustrations, and good humor. They are inspirational and motivational. And they are preachable and need to be preached time and again in this generation. Harvey C. Bream, Jr. is past President of the Cincinnati Bible Seminary and now the Chancellor of Cincinnati Bible Seminary. Reggie Thomas has one consuming passion; one dream; one goal; one thought; and that is to evangelize! Evangelize! Evangelize! Like Paul who said, "This ONE thing I do , , . ", there is one thing on his mind, evangelism! This includes preaching the ancient apostolic gospel and establishing the New Testament church in every nation in the world. It has already taken him into 53 countries, where he has been mightily used to win the lost in their thousands, and establish the Church of Christ in numerous villages, towns and cities across the globe. His untiring efforts and unselfish giving of himself in this dif ficult and often dangerous ministry of world evangelism, are an inspiration and challenge to all who have had the privilege of knowing him and working with him. He has been blessed with a keen mind, a warm personality, and a gripping voice that projects his deep sincerity. In the midst of great success and honor, he has maintained a humble and caring spirit. May his tribe increase! It is also my prayer that those seeking God with all their heart, through reading his sermons and come to know the truth which alone can set us free. Doug Willis is a native Australian. He has devoted his life to world evangelism and travels throughout the world preaching the Gospel.